To the outside world, Mormons can seem pretty homogenous. You may picture young missionaries in white shirts and ties riding their bicycles. Or you might imagine a large white family with a professional father, a stay-at-home mother, and a half-dozen young children. 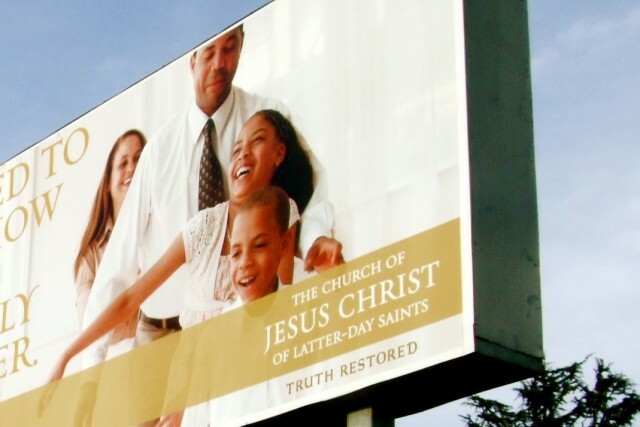 The Mormon Church (officially the Church of Jesus Christ of Latter-day Saints, or LDS Church) is working hard to counter this image of stereotypical whiteness and conformity. Certainly, it is a woefully inaccurate portrait of the church, as anyone familiar with any of our Los Angeles congregations will tell you. One of my favorite elements of the Church is the way it fosters relationships across boundaries of race and class. LDS congregations are divided along fixed geographical boundaries. A local congregation, known as a ward, will encompass 100 to 200 active Mormons, those who show up to church most Sundays and share the load of making the Church function at the local level. Some five to 12 wards are grouped into larger geographical divisions called stakes. In Utah, a ward may encompass only a few city blocks, but in other areas of the nation with smaller concentrations of Mormons, ward boundaries can be quite large. Where I grew up in Phoenix, Arizona, our ward boundaries for many years were two miles by two miles in size. When I lived in the Los Feliz neighborhood of Los Angeles, I belonged to the Hollywood Ward in the Los Angeles Stake. The ward boundaries encompass the neighborhoods of Los Feliz, Silver Lake, East Hollywood, Larchmont, and Hollywood, plus significant parts of West Hollywood, the Hollywood Hills, Fairfax, and Hancock Park. Latter-day Saints who live in that area go to church together in a little building on Normandie between Sunset and Hollywood. Those attending services each Sunday reflect the diversity of those areas, with a mix of English and foreign-language speakers, the native and foreign-born, the working poor and the wealthy. The broader Los Angeles Stake includes an even greater mix, stretching from Bel-Air to South and East L.A.
LDS wards are led by a bishop, a spiritual and administrative leader chosen from among the congregation to serve for a period of four to seven years, on a voluntary basis. For part of the time I was in the Hollywood Ward, the bishop was an Argentinean immigrant. He and his wife joined the LDS Church in Argentina in their early adulthood. When he was 35, they decided to begin a new life in the United States. They moved to New York, entered the restaurant business, and chose to attend one of the Church’s optional Spanish-language congregations. When his businesses later collapsed, he and his wife drove to Los Angeles to start a new life. This time they decided not to join a Spanish-language congregation so they could improve their English proficiency. He never imagined that in his late 60s he would be called to lead a ward. But for a ward reflecting the diversity of Los Angeles, he was the perfect choice. While in the Hollywood Ward, I taught a Sunday school class for those joining the LDS Church, or returning after a period of non-attendance. The class also had plenty of active church members who wanted to reach out and support those joining us. In a class of about 25, we regularly had about a dozen languages swirling about, and it wasn’t unusual to have half a dozen countries of origin represented. Employment was just as varied, from day laborers to small business owners, from students to professionals (and always, of course, an aspiring actor or two). Across these many lines we shared some of our deepest personal experiences. Now I live in a ward that includes much of Pasadena and Altadena. Most Sundays, my wife and I give a ride to some neighbors from around the corner: a single mother from Mexico and her son. We sometimes also picked up a young man who recently left for two years to do missionary work, an immigrant from Jamaica. Both the woman and the young man are converts to the LDS Church and the only members of their families to join. I’m not sure in what other context I, from a middle-class white family in suburban Phoenix, would be driving in a car with people of these backgrounds. But they have become good friends and an essential part of my community. In the Hollywood Ward you would be hard-pressed to find a stereotypical Mormon family with a professional father, a stay-at-home mother, and a gaggle of well-dressed white, English-speaking children. You’d be more likely to find immigrants struggling with their English, many of whom joined the LDS Church as opposed to being born into it. In Pasadena, the stereotypical “Romneyesque” Mormon family would be easier to find. But there’s still plenty of diversity. In just a few months, the Pasadena Ward will be supporting three local young men in their missionary work. All three are converts to the Church who immigrated from Africa or the Caribbean. Of course, the LDS Church’s record on diversity is not perfect. The Church could do more to own up to its past policies excluding those of African descent from equal status. The LDS Church sometimes struggles to show its genuine care for its neighbors beyond a desire to win them to the faith. But in more subtle ways it is already promoting diverse interactions internally, with profound effects. Consider, for instance, this little-covered aspect of Mitt Romney’s experience: his service as a local bishop and stake president in Boston. In those positions, he volunteered his time as the spiritual and administrative leader of all the Mormons within his congregational boundaries, areas that included as much class and social diversity as is found in Los Angeles. This was the one part of Romney’s life where he could not have remained comfortably embedded with the wealthy elite. Instead, he would have spent most of his time ministering both individually and collectively to those in need. It may not have come naturally, but he spent a lot of years working on it, for reasons that had little to do with financial gain or courting voters. I am not personally fond of Mitt Romney’s politics, especially not this primary season’s version of them. But I have at least this hope: If he does become the next president of the United States and does seek to represent all the people, he can draw on his daily experience in the LDS Church. In my experience, it is a church that not only declares that we are all children of God but reinforces that declaration by bringing us together each week to reach across our other divisions. Jason LaBau is a postdoctoral research fellow at the Huntington-USC Institute on California and the West (ICW). He is currently at work on a book about the history of Republican politics in Arizona. *Top photo courtesy of waltarrrrr. Interior photo courtesy of Jason LaBau.